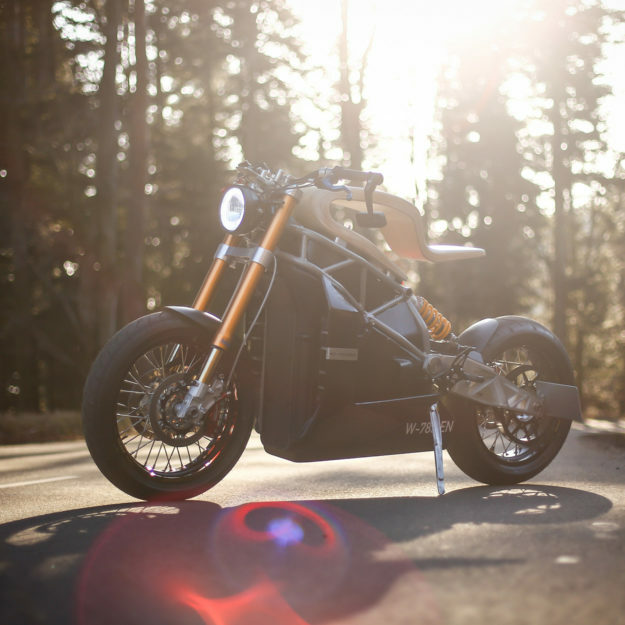 Love ’em or hate ’em, electric bikes are an opportunity to look at motorcycle design with fresh eyes. Sure, they still need wheels, suspension and handlebars—but they don’t need gas tanks or exhausts. We spend our days looking at ‘unconventional’ bikes, so we get excited when we see something completely new. 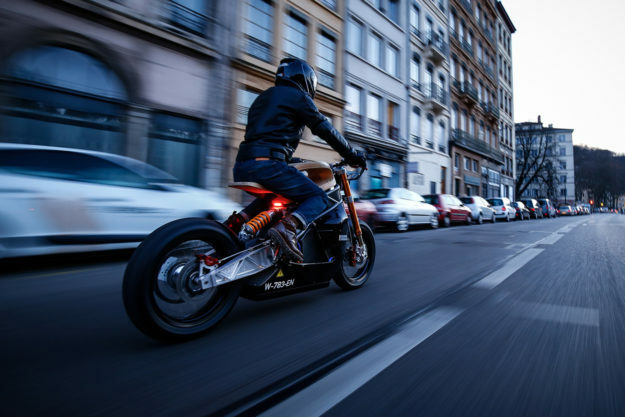 And despite the eye-watering price tag, we’re rather taken with the radical ‘e-raw’ from Essence Motocycles of Lyon, France. Essence founder Martin Hulin starting working on the e-raw concept two years ago as an after hours project. He assembled a group of craftsmen to build a rolling prototype, which broke cover on our Instagram account, and quickly spread through the interwebs. Martin tells us the publicity gave him just the spark he needed. He kept developing the concept, found partners, built a team and launched the Essence company. And now version 3.1 of e-raw is ready. 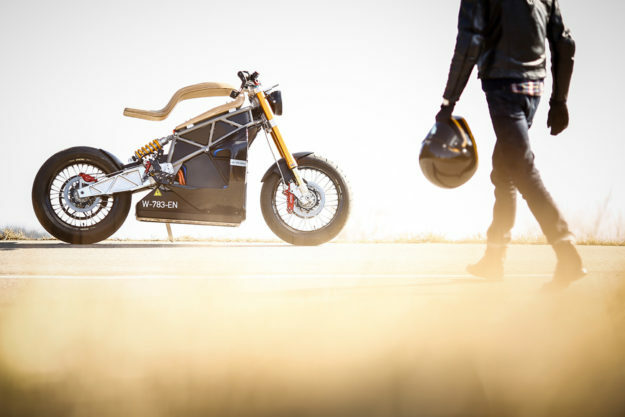 So Essence have designed this machine to be as minimal as possible—taking advantage of the electric drivetrain’s simplicity, and paring down the traditional motorcycle bits. They’ve also blended modern tech with old-world craftsmanship, with an emphasis on raw materials like steel, aluminum and wood. 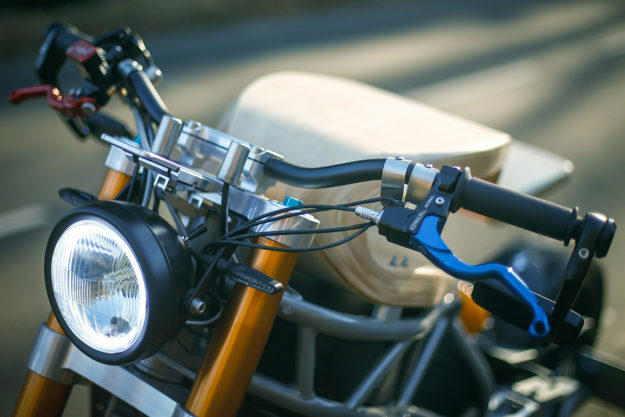 The backbone is a one-off steel trellis frame, hooked up to an aluminum swingarm machined by a third party. 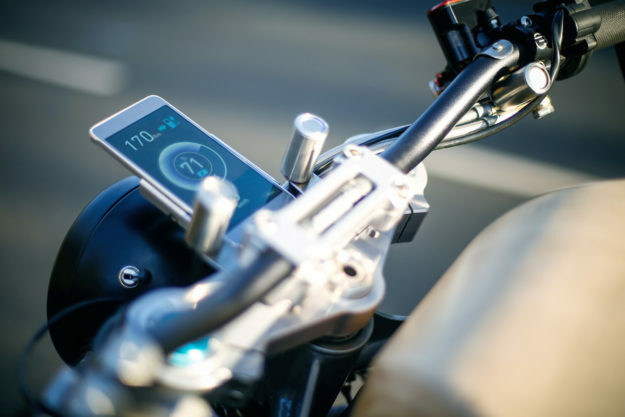 Everything’s centralized around the frame; a large battery cover anchors the bike visually, and hides any unsightly components and wires. 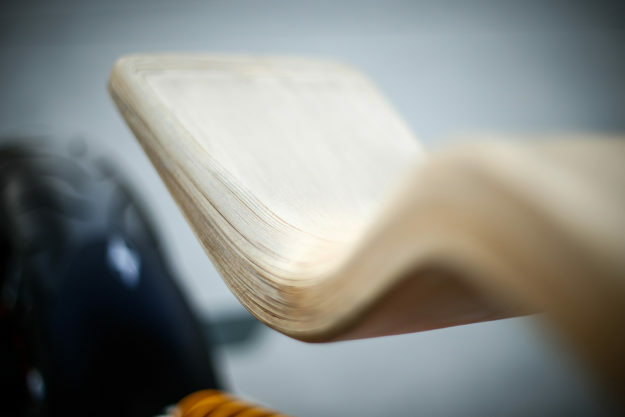 But the real visual hit is sitting up top: a wooden seat, designed to mimic a traditional motorcycle’s silhouette. Martin wanted hints of classic and custom bikes in e-raw’s design, and this was one way to achieve that—while also drawing attention to the fact that there is, in fact, no fuel tank. Made out of plywood using traditional surfboard shaping techniques, it’s apparently more comfortable than it looks. You can adjust the height too, though we can’t quite figure out how. It’s an esoteric look for sure, but it’s one that speaks to us. And Essence backs it up with a host of top-shelf components—starting with Öhlins suspension at both ends. The rims are 17” Excel units, and the brakes and controls are from Beringer. As for the wired parts: The motor’s from Pymco, and the battery management system is from Elektromotus. The battery pack is an in-house design developed by Martin’s partner, Pierre-Yves, and it uses a CCS quick charging system. So it’s ready to go in thirty minutes, with a range of 185km. More importantly, it’s compact and very neatly packaged. Ahead of the rider are classy Renthal bars, custom switches and brake levers on both sides. 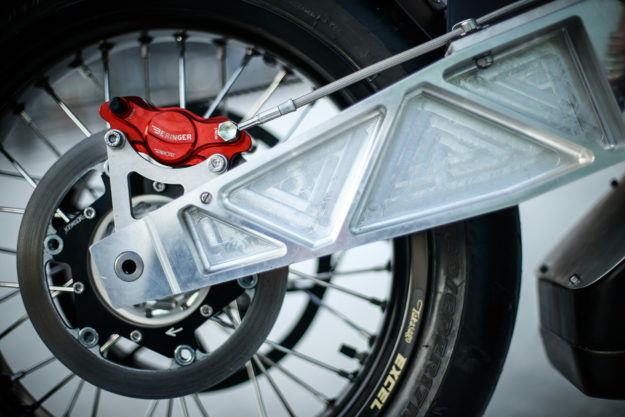 The right hand lever and foot brake operate the front and rear discs, just as you’d expect, while the left side lever engages the motor’s regenerative braking system. There’s also a neatly machined mount for a smartphone. The phone acts as a speedo, feeding back the usual info, plus useful tidbits like your remaining range. We don’t have all the numbers, but we know that battery capacity is 10.1kWh, peak power is 80kW and peak torque is 180 Nm. 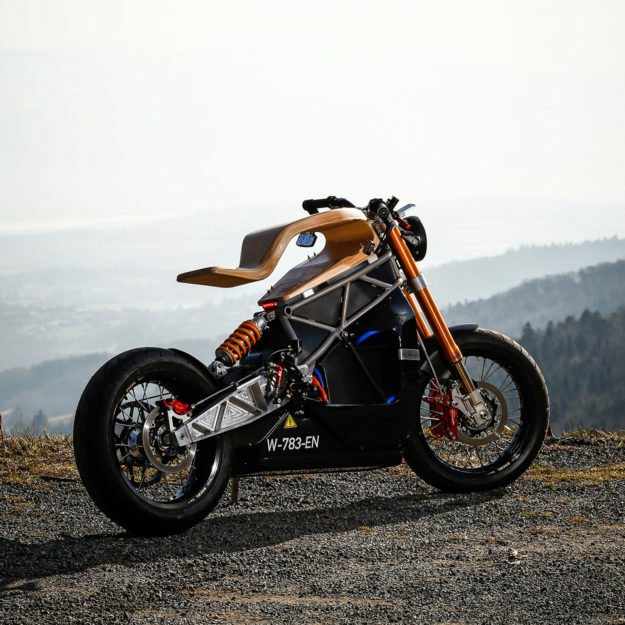 Weight is 167 kilos (368 pounds), top speed is 155 kph (96 mph) and the e-raw zooms to 100 kph in less than 3.5 seconds. All told, it’s a very respectable score sheet. Let’s face it—kooky concepts are a dime a dozen, but seldom do they have any real-world appeal. When you add up the striking aesthetic, the stats, the parts spec and the fact that the rider ergonomics appear to be sorted, the e-raw starts to make sense. That is, if you can afford one. 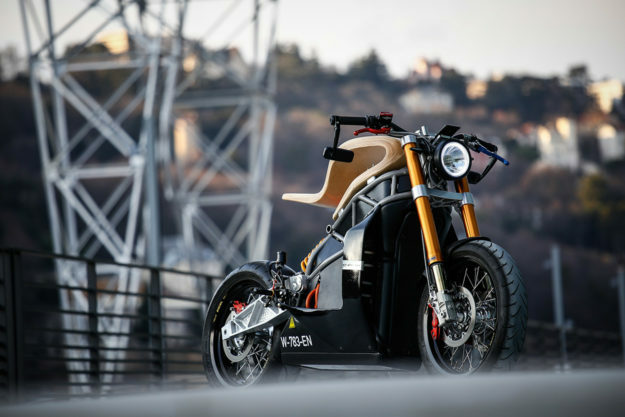 Essence plans to build ten, each made to order with certain customization options, and each coming in at around 55,000 euros (just under $60,000) depending on the final configuration. If our piggy banks were that loaded, we’d be breaking them open right now. Would you?